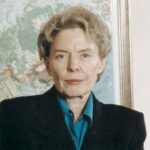 Jeane J. Kirkpatrick served for more than four years as the U.S. Ambassador to the United Nations and was a member of the presidential cabinet. Resigning her post in 1985, she returned to Georgetown University as Leavey Professor and to the American Enterprise Institute as Senior Fellow. In 1985 President Reagan awarded her the Medal of Freedom. Her most recent book is The Withering Away of the Totalitarian State…and Other Surprises. Editor's Preview: In May of 1985, at the request of the U.S. Department of State, the Shavano Institute for National Leadership sponsored a conference entitled "Moral Equivalence: False Images of U.S. and Soviet Values" in Washington, D.C. Forty-five participants from the United States, Russia, Great Britian, France, Italy, Latin America, and Central Europe accepted the invitation to examine the issue of an alleged "moral equivalence" between the two "superpowers." The attention this conference has received has been substantial. Articles have appeared in dozens of national publications such as Time, the Wall Street Journal, National Review, Policy Review, the Washington Post, the Washington Times, the New York Post, and the New York Times, as well as in over 500 other newspapers throughout the nation. In the next three months, Imprimis will feature addresses by Jeane J. Kirkpatrick, Sidney Hook, and Joseph Sobran which will appear in Scorpions in a Bottle: Dangerous Ideas About the United States and the Soviet Union, an upcoming volume of the Hillsdale College Press. In this issue, Ambassador Kirkpatrick, who touched off the "moral equivalence" debate in London at Chatham House, the Royal Institute of International Affairs, in April of 1984, discusses the assault on Western democracy which this doctrine represents. One final note is necessary: In light of Hillsdale College's 142 year-old commitment to independence and its continuing battles in the courts over its refusal to sign federal compliance forms, the Shavano Institute refused to accept any funds from the State Department for the cost of the conference or its publications. The object of revolution, like war, is to attain coercive predominance over the enemy as a means of working one’s will with him. Revolutionary propaganda selects symbols which are calculated to detach the affections of the masses from the existing symbols of authority and to attach their affections to challenging symbols and to direct hostilities toward existing symbols of authority. He went on to say that constituted authorities perpetuate themselves by shaping the conscience of those who fall within their sphere of control. Hence, great revolutions are always deep ruptures of conscience. We are living today in a revolutionary era in which the force which purports to be the great world revolution of our times, Marxist/Leninism, seeks, by a variety of means, including skillful semantic manipulations, to extend its own hegemony. The Soviets have made extraordinarily great progress in extending their own influence and projecting their own semantic rules upon the rest of the world. There was a time when an educated person found it persuasive to see important differences between the conceptions of civilization embodied, for example, in the U.S. Constitution or the British Constitution or the United Nations Charter, on the one hand, and the conception of civilization embodied in the theory and practice of the Soviet Constitution in any of its multiple mutations, on the other. And the conception of a bipolar political world has been similarly replaced by a prevalent worldview which rests on the belief that the world is in the grip of a contest between two superpowers. These superpowers contend for dominance and resemble one another in key respects. This image of moral and political symmetry has gained a wide acceptance not only in the Third World, but also among our allies and ourselves. Of my own statements about the false nature of this image, a colleague has said, “She talks about the moral differences between the superpowers, and when we fail to find any moral difference between Afghanistan and Grenada she makes it clear that we are dimwitted.” I believe that anyone who fails to see a difference between Grenada and Afghanistan is not only seriously mistaken but very seriously confused, and that their confusion is a direct consequence of the Soviets’ colossally effective assault on the realms of value and meaning which our civilization holds dear. That assault has, it must be underscored, had many successes. In the speech which I delivered at Chatham House in London in 1984 on moral equivalence, the question was, “Is there a moral difference between the superpowers?” I quoted a number of English commentators on the United States and I did not name them. That was a demonstration of both restraint and diplomacy on my part. While a Washington Post columnist suggested that I had outdone myself in finding esoteric figures to quote to make my point, I can assure you that the persons whom I quoted were anything but esoteric. They are leading representatives of the major parties of our perhaps closest friend and ally, the United Kingdom. One of those persons, who will remain nameless here (I called him simply, an MP), asserted that there was an uncanny resemblance between the superpowers. Another charged that if governments assign to themselves the right to change the governments of other sovereign states, there can be no peace in this world and that this is perhaps the most dangerous age which the human race has ever known. And, he said, it is quite improper for honorable members to condemn, as we have, the violation of international law by the Soviet Union in its attack on Czechoslovakia and Afghanistan if we do not apply the same standards to the United States’ attack on Grenada. In a recent debate at Oxford our Secretary of Defense barely won. He squeaked through to a victory on the question of whether there is a moral difference between the superpowers. In another debate Congressman Newt Gingrich, comporting himself brilliantly, lost on the question of whether U.S. policy in Central America was consistent with the moral values and traditions of Western civilization. He lost that debate, of course, to a Nicaraguan government official. To destroy a society it is first necessary to delegitimize its basic institutions so as to detach the identifications and affections of its citizens from the institutions and authorities of the society marked for destruction. This delegitimization may be achieved by attacking a society’s practices in terms of its own deeply held values, or it may be achieved by attacking the values themselves. The latter course was undertaken by the fascists and Nazi movements which rejected outright the basic values of Western liberal democratic civilization. They rejected democracy, liberty, equality, and forthrightly, frankly, embraced principles of leadership, obedience and hierarchy as alternatives to the hated basic values of democracy. Unlike the fascists, Marxists, of course, do not attack our basic values forthrightly. Instead, they denounce our societies in terms of our own values. They do not postulate alternative values; they postulate a radical critique of our societies and institutions by expropriating our language, our values. Thus democracies are attacked as not truly democratic, because they cannot guarantee economic equality. The argument follows that this makes political equality impossible and in the absence of political equality, it has been asserted that there cannot be free elections or freedom of any sort. Or the absence of perfect political equality in an electoral system means that the elections are a fraud. Their point is that a regime whose practices systematically betray their basic values is obviously a failed regime. If our practices betray our own deepest values then we fail; we are a failed regime. If we pretend to hallow values which our practices do not perfectly achieve, then we are guilty of falsification. So we are both a failure and a fraud. Obviously, such a regime does not deserve the loyalty or affection of either its citizens or its friends. Thus, if the United States is a fraudulent, falsifying society which exploits its workers and subjugates all in a facade of democracy, then it is obviously not worthy of respect. The Soviet assault on liberal democratic legitimacy involves a very complex, comprehensive, multifaceted strategy. First, it involves a demonstration of the failure of Western democracies to meet their own standards which are regarded as utopian measuring rods. Second, it proceeds by continuous falsification of Soviet practices and assertions of Soviet loyalty to basic Western values. At the same time that it is suggested that we do not respect our own values, it is claimed by the Soviets that they do. Our flaws are exaggerated, theirs are simply denied. Third, the conclusion is, of course, inexorably arrived at, that there is, at best, not a dime’s worth of difference between these two regimes. Marxism incorporates, at the verbal level and the intellectual level, the values of liberal democracy in its assault on liberal democracy and this is precisely why it entraps so many Western intellectuals who are themselves serious liberal democrats. Thus the slightest restriction on, let’s say, the presumption of innocence of the accused is said to demonstrate the absence of the rule of law. The slightest failure of an electoral system demonstrates contempt for political equality. Any use of force in international affairs establishes the lawless character of the society. Now, it is a short step from having demonstrated that a country like the United States is not a law-abiding society to demonstrating that it is lost and that it is like any other lawless society. The Soviets can always claim “We are no worse than you. Even if we are a lawless society, you too are a lawless society, we are no worse than you.” This is the “logic” of the doctrine of moral equivalence. If practices are measured by abstract, absolute standards, practices are always found wanting. The communists who criticize liberal democratic societies measure our practices by our standards and deny the relevance of their practices to judgments concerning the moral worth of our own society. An alliance among democracies is based on shared ideals. The process of delegitimization is, therefore, an absolutely ideal instrument for undermining an alliance, as well as for undermining a government. The NATO alliance among democracies simply cannot survive a widespread conviction among its members that there is no difference between the superpowers. It is not necessary to demonstrate that the Soviet Union is flawed, or deplorable. To destroy the alliance, it is only necessary to deprive the citizens of democratic societies of a sense of shared moral purpose which underlies common identifications and common efforts. When our democratic allies can see no difference between American and Soviet behavior, then obviously there is no moral basis for a continuing association. There may be grounds in wartime under extreme duress for democracies to ally themselves with countries which are morally reprehensible, but there cannot be, for democracies, adequate justification for long-range peacetime association. It’s perfectly clear that the tendency to self-debasement, self-denigration which has been so brilliantly commented upon by the French scholar Jean-Francois Revel and others recently is rooted in this practice of measuring Western democratic societies by utopian standards. There is simply no way that such measurements can result in anything but chronic, continuous self-debasement, self-criticism, and finally, self-disgust. The problem of dealing with this is complicated by the fact that the values in question are our own values. The response, of course, must be that it is not appropriate to judge actual social practices by utopian standards of political values. So, we must simultaneously affirm our values and accept their relevance to our practice while denying that they are the measuring rods that the Soviets claim they are. That is the challenge which confronts us, and is by no means an easy one. Another major dimension of the Soviet assault on our values takes place through the systematic redefinition of the terms of political discourse. George Orwell, as usual, has said it very well in his Epilogue to 1984. He said the purpose of “Newspeak” was not only to provide a medium of expression for the worldview and mental habits proper to devotees of “Ingsoc,” but to make all other modes of thought impossible. A heretical thought would literally be unthinkable so far as it is dependent on words. The systematic redefinition of terms of political discourse is very far advanced, making it very difficult to think thoughts other than those indicated by the definition. In real life, nowhere is this clearer than in the concept of human rights. Human rights, enshrined as the purpose of the United Nations Charter and at the heart of the American and the Western democratic tradition, have been redefined in contemporary international discourse and utilized by the great human rights organizations in their new definitions. According to their new definitions, human rights violations are failures of governments, vis-a-vis their citizens. Terrorist groups do not violate human rights in the current vernacular; only governments violate human rights. Thus the government of El Salvador is continually attacked for gross violations of human rights in responding to terrorist assault. Guerillas are not attacked for violations of human rights, although they may massacre half of the inhabitants of a hamlet, dragging them from their beds in the middle of the night. That is not a violation of human rights by definition: That is a protest of a national liberation movement. The guerillas, by definition, are a national liberation movement. National liberation movements do not violate human rights. They have their human rights violated. National liberation movements assault societies and when governments respond, they (the governments) are criticized vigorously as repressive and unethical. I once encountered in a public presentation the assertion from an earnest young man that the government of El Salvador was guilty of the murder of 50,000, and this was proof, obviously, of gross violations of human rights and a sufficient demonstration that the government of El Salvador was unworthy of U.S. support. The fact is, of course, that approximately 50,000 people have died in El Salvador as a consequence of a guerilla war. But the government is simultaneously held responsible for maintaining order, protecting its citizens, and for responding to violence, so it is responsible for all the deaths in the society. The semantics of human rights and national liberation movements are extraordinary. It is necessary only to look at the sober discussions of human rights in such places as the Amnesty International Reports or the Helsinki Watch discussions to see that those organizations and most of the people who discuss the subject today are using skewed vocabulary which guarantees the outcome of the investigation by definition. The “newspeak” of human rights morally invalidates the governments by definition and morally exculpates the guerillas by definition. The theft of words like genocide and the language which appears in documents like the United Nations Charter and the Geneva Convention are other examples of systematic comprehensive effort at semantic rectification. In the United Nations, of course, genocide is regularly charged against Israel and only Israel is regularly described as violating the Geneva Convention. Along with the terms go the documents in which the values are enshrined and codified. What further complicates this is the effort not only to redefine values but to eliminate any epistemological standard—any standard of proof—by which events might be objectively observed and through which we might have appeal to the double bind in which the semantic falsification puts us. Totalitarian ideologies, including Marxism, are inevitably, invariably, anti-empirical. Not only do they deny that there is any sort of objective truth, they deny effectively empirical verification and procedures of empirical verification because they make truth, and not only truth, but reality, dependent on power relations, i.e., truth and objective reality are ultimately defined in a totalitarian ideology by those people who hold power. There is an elaborate ideological justification for this, according to which only Marxists are capable of seeing through the layers of obfuscation with which the existing exploiting powers have shrouded reality. Only the bearers of the totalitarian ideology have the capacity to de-mystify and define reality. The totalitarian ideology, of which Marxism is the supreme example in our times, makes truth a function of power which is finally enforced by terror. Truth and reality are continually readjusted to serve the purposes of power at any given time. This is the reason that in 1984, history is continually re-written. It isn’t just re-written once; it’s re-written on a daily basis. And it is re-written from week to week and year to year to fit the requirements of the moment. Words, relationships, and events are redefined, and reality becomes a sub-category of politics. There is, then, no appeal from the arbitrary definitions of the revolutionary ideology. The redefinition of reality in the United Nations is dramatic. The first and most memorable examples which I witnessed were the attacks (they are annual, I later discovered) of Andrei Gromyko on the United States for intervention in the internal affairs of Afghanistan and for destroying the possibilities for peace in Afghanistan. While that charge might not be too serious if it were uttered by someone in a position of less influence and power than Andrei Gromyko, it is very serious indeed when it is backed by the full power, in an organization like the United Nations, of the Soviet Union and the Soviet bloc. The charge that the United States is guilty of preventing peace in Afghanistan has now become a part of the negotiating position of the Soviet Union in which they suggest that the principle obstacle to the pacification of Afghanistan is American support for resistance forces in Afghanistan. That is an argument which one can hear in the United Nations anytime the question of Afghanistan is discussed. It is an argument which representatives of the mediators come and whisper quietly to us at the U.S. Mission or the State Department: Couldn’t we try harder to understand that perhaps the biggest obstacle for peace is American support for the resistance movement? Conceptions of reality are continually manipulated as part of the process of redefinition. There are many examples, but none more blatant than in the case of Nicaragua where the first symbolic redefinition/theft took place in the appropriation of the name of Augusto Sandino. Actually, Sandino was a nationalist and a patriot who was explicitly hostile to communism and who broke with the Salvadoran communist leadership precisely on grounds that the communists could betray the nationalist character of the revolution that Sandino stood for. There is a colossal theft and redefinition in the very name Sandinista. It matters because the name of Sandino has great prestige; he is a great national symbol in Nicaragua, a symbol of independence. It is a theft which both falsifies and confuses—confuses the Nicaraguans initially and confuses international observers about whether this government is nationalist, the bearer of authentic nationalist aspirations, or whether it is something else. Semantic obfuscation in Nicaragua also proceeds apace with regard to the Catholic Church. The Nicaraguan government is probably the first to attempt, systematically, to incorporate the symbols of Christianity into a comprehensive fashion into state ideology. The establishment of a “popular church,” a so-called parallel to the Catholic Church, is but one artifact of that effort to incorporate the symbols of Christianity. Most of the major rallies in Nicaragua today include the symbol of a soldier with his arms outstretched. It is a novel attempt to identify the Sandinista revolution with the cross. Christ is depicted on the cross and in the background there is a sort of shadow with its arms outstretched in the form of a cross. He is a guerilla with a rifle. Along with this kind of redefinition, falsification, and utopianism goes something and that is a simply colossal historical denial, especially on the part of the Russians. Their systematic continuous denial of their own history and practices is epitomized by their denial of the Ukrainian famine, which was denied for decades successfully and is still denied today. The Ukrainian famine is a non-event in the view of Soviet interpreters of reality. But not only is the Ukrainian famine a non-event like the infamous Kaytn massacre in 1939, but the current shipment of arms from Nicaragua to El Salvador is a non-event as well. The experience of confronting a spokesman for the Nicaraguan government in a public arena and listening to him deny that the Nicaraguan government is engaged in the shipment and transshipment of arms in a deliberate attempt to destabilize the government of El Salvador is simply an extraordinary experience. There is no more misleading concept abroad today than this concept of superpower rivalry and the concept of superpower equivalence. The concept of superpower rivalry is the first premise in a syllogism in which moral equivalence is the conclusion. Once you view the United States and the Soviet Union as contending for the world, you have already suggested a symmetry between their goals: to dominate the world. The fact is, of course, that we do not seek to dominate the world. We do not seek colonies. We do, in fact, seek to foster a world of independent nations. But whenever anyone suggests that the world is dominated by superpower rivalries, they imply that we have some goal other than fostering and preserving a world of independent nations. Otherwise the concept of superpower rivalry makes no sense. But if there is only one power which seeks to undermine and subvert the independence of nations, then there is no question of superpower rivalry, and there isn’t even a question of a contest between the United States and that imperialistic power. There is a contest between the imperialistic power and all other countries who desire to preserve their independence. The very notion of superpower rivalry undermines, at the epistemological level as well as the political level, the notion of a serious distinction between the U.S. and the U.S.S.R. and also undermines the reality of the opposition of Soviet goals to the goals of all independent nations and the desires of all independent nations. It is very important to understand that not only are questions of politics involved here, but also the most basic questions of morality and meaning. In a very interesting little book, Ethics of Rhetoric, Richard Weaver said, “It is the nature of the conscious life of man to revolve around some concept of value.” So true is this, Weaver added, that where the concept is withdrawn, the human being suffers an almost intolerable sense of loss. As our lives revolve around values, they also revolve around meaning and epistemological stability. We must recognize and defend a concept of meaning to which that concept of value is, of course, absolutely essential: a concept of epistemological stability, if you will, a concept of reality which is not, in fact, a function of power and does not shift from day to day to fit the political needs of a totalitarian group.